On Thursday, 4 November, I wrote to Joan Kirkbride, Head of Operations, National Research Ethics Service (NRES). My letter expanded on some of the concerns I had raised, in August, with the Director of Legal Services, University of Bristol, in a formal request for an Internal Review of the Information Rights Officer’s decision (17 June) to decline to provide certain information on the basis that this information was exempt from disclosure under section 22(1)(a) of the Freedom of Information Act 2000 (information intended for future publication). I also included other concerns. 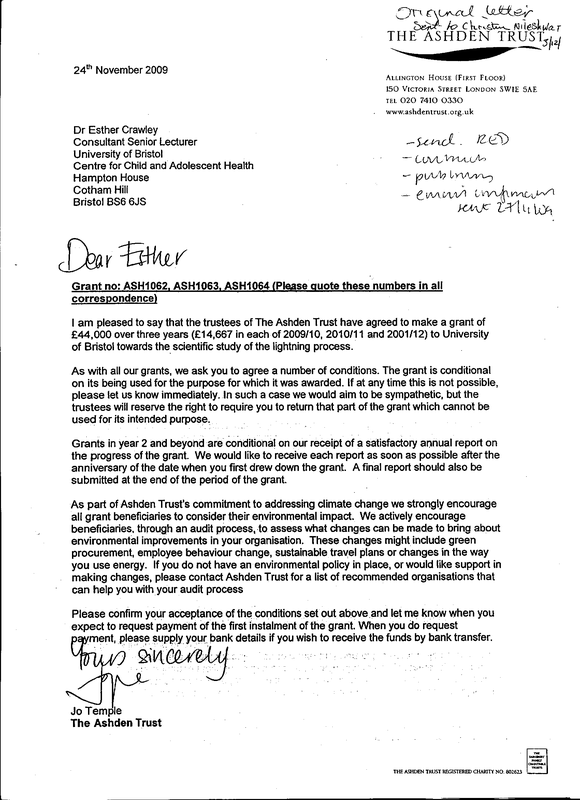 I gave Ms Kirkbride permission for my concerns to be forwarded, in full, to any individuals charged with the scrutiny of complaints in response to the decision to grant the Lightning Process pilot study ethics approval, within the NRES, within South West 2 REC and including the sponsors, Chief Investigator, co-applicants and study funders. I requested confirmation that my communication had been received and my concerns noted. Today, I received an acknowledgement from Ms Kirkbride which she has CCd to a colleague who is understood to be involved with the scrutiny of complaints. She has appended a copy of the standard response which NRES is sending to all respondents on this matter. That she advises that NRES “do feel that they now have sufficient information available to [them] and that no new issues are being raised in correspondence which is being sent to [them] for consideration”. That she has copied my email to the Chief Investigator and Sponsor as I had given permission to do so. That I “had raised a number of specific questions outside the remit of NRES where [they] cannot provide a response and the answer to my questions would need to come from either the CI [Chief Investigator] or the sponsor”. “Given that this treatment is currently available, ME society survey data suggests it has a similar profile to other therapies and the split opinions in the ME community (this study has the support of particular ME charities who have also been involved in its planning) we feel that a fair way forward is to seek the responses of the researchers, sponsor and the ME charities involved in the development of the study before asking the REC to review its favourable opinion. We also note that in this project, subjects will not be deprived of what is current care in this clinic. Research participants will receive this intervention in addition to their standard treatment. I am given to understand that at least two others who wrote to Ms Kirkbride, last week, have received similar responses. Dr Esther Crawley’s research team had secured funding for the controversial Lightning Process pilot study using children as young as 12 from the Linbury Trust and the Ashden Trust, last November. The study received ethics approval this September. The Linbury Trust has funded a number of “CFS” studies in the past, including some previous studies by Dr Crawley’s research team. But the Ashden Trust doesn’t appear to have a history of funding health/medical research. Both trusts are funding arms of the Sainsbury family. including any accompanying documentation that formed part of the applications for funding. 2] Copies of all correspondence associated with the applications for funding. The response has been that there was no “funding application”, as such; that the study protocol had been submitted to the funders and, in effect, was the funding application. 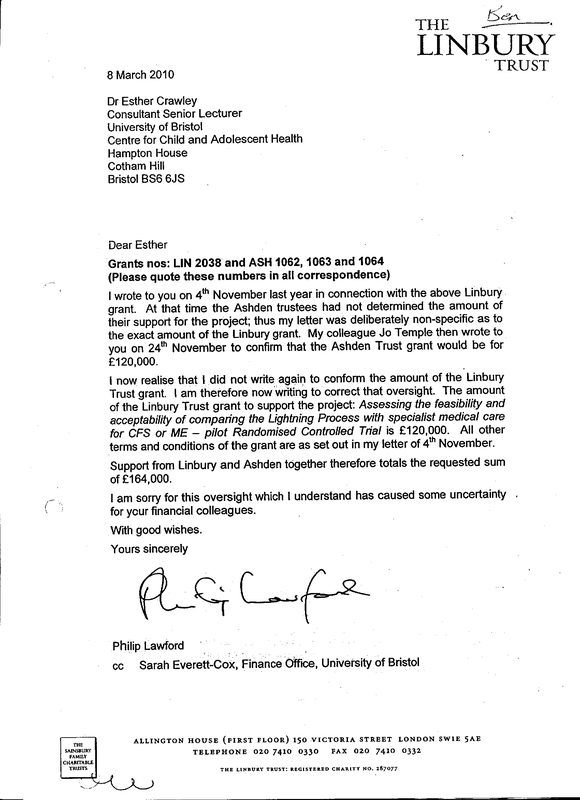 I have been provided with copies of three letters from the Linbury Trust and Ashden Trust in relation to the funding application (that had previously been disclosed under FOI in response to requests made by others) which I have already posted on this site. I am advised that there is a typo in the Linbury Trust letter of 8 March 2010 and that the “£120,000” in the opening paragraph should have read “£44,000”. “Thank you for your letter informing me that the trustees of the Linbury Trust have agreed to make a grant to support the project: Assessing the feasibility and acceptability of comparing the Lightning Process with specialist medical care for CFS/ME. “I am delighted that we will be able to do this piece of work and I am very grateful to the Linbury Trust for supporting this work. Note: The grant is conditional on the project commencing no later than October 2010. The research application had been reviewed by South West 2 REC at a meeting of the committee on 8 July. Following the meeting, the committee had requested that the applicants make a number of amendments to the text of patient information sheets (PIS) and other documentation. Confirmation of approval of the revisions to the application was given in September. Since this is all the information relating to the application for funding that has been made available to me, it remains unclear why the Linbury Trust was not in a position to award the full £164,000 for the project and why £44,000 has been provided by the Ashden Trust for a medical research study in children – a field which appears to lie outside the Trust’s usual areas of funding, which are listed on its website as “climate change, sustainable development and improving the quality of life in poorer communities”. 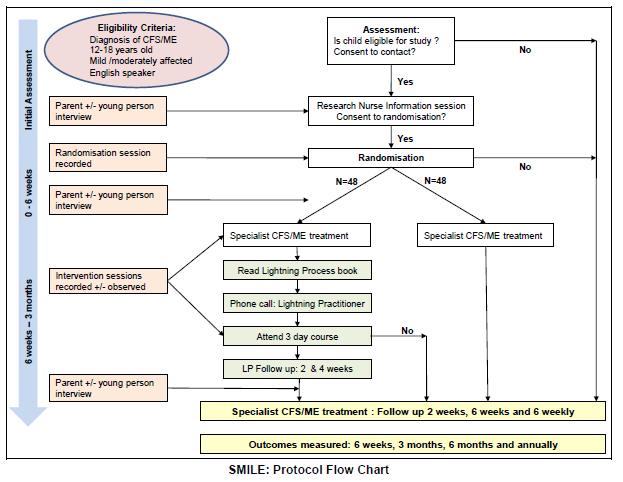 Other than a protocol document, it is unclear how much information about the Lightning Process and how it is carried out was available to the funders in order that they might make informed decisions about whether to fund this study.